Shouts out to chukchee for posting this album a few years ago, but this albums needs more attention so I'm posting it again. 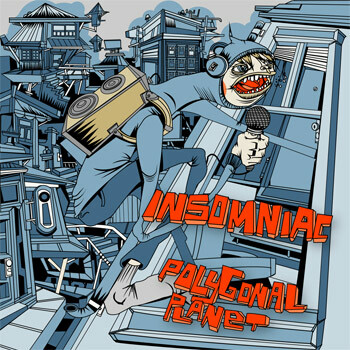 Released in 2005, Polygonal Planet is the first full length album from legendary bay area MC Insomniac. 15 tracks of straight bangers featuring Roughneck Jihad, Mike Boo, D-Styles, Ricci Rucker, Raggedy Andy, Klingon Ron and Spex. Sounds interesting, thanks for bringing it up! Thank you for posting this..I hope people hear it and enjoy it! That 7" was really dope, the Spex track Someway Know How on the A side is probably one of my favorite Spex tracks and that 7" still gets lots of play around here. There is also a 12" from the Polygonal Planet album called The Muse, which features 3 tracks and their instrumentals. do u have the spex and kegs radio show? from 2004? i only have it as tapes. and its more than 10 tapes, dont have the equipment to put it on cd or hardrive.. its a real pity..